Buenos Aires is the capital of Argentina and its largest city. It is located on the southern shore of the Río de la Plata, 150 miles (240 kilometers) from the Atlantic Ocean. It is one of the world's largest cities and one of its most important ports. Buenos Aires is the center of the Argentina's government, commerce, business, politics, and culture. Its wealth and influence dominate the life of the rest of the nation and extend well beyond the nation’s borders. The city covers an area of 77 square miles (200 square kilometers). The total metropolitan area, however, spreads over 1,421 square miles (3,680 square kilometers). About a third of Argentina's people live in the Buenos Aires metropolitan area, which has a population of over 13 million. Most residents of Buenos Aires have European origins, and the art and architecture of the city reflects this. However Buenos Aires is a magnet for immigration from poorer neighboring countries, as well as significant numbers of people from Asian countries. Map of Buenos Aires of 1530s. A NASA satellite photo of the Río de la Plata area. Gran Buenos Aires can be seen on the right. One tradition says Buenos Aires was originally named after the Virgine de Bonaria of Cagliari, Sardinia. According to another tradition, sixteenth century Spanish sailors named the port for their patron saint, Santa María del Buen Aire (Saint Mary of the Good Air). Argentines sometimes refer to Buenos Aires as Capital Federal to differentiate the city from the province of the same name. The abbreviations Bs. As., Baires, and B.A. are sometimes used, the first one mostly in writing and the latter two in everyday speech. The city is sometimes called La Reina del Plata, that is, "The Queen of the Plate" (a reference to the Plate river basin). Portuguese seaman Juan Díaz de Solís, navigating in the name of Spain, was the first European to reach the Río de la Plata in 1516, but his expedition was cut short by an attack in which he was killed by the native Charrúa or Guaraní tribe, in today's Uruguay. The city was first established as Ciudad de Nuestra Señora Santa María del Buen Ayre (literally "City of Our Lady Saint Mary of the Fair Winds") on February 2, 1536 by a Spanish expedition under Pedro de Mendoza. The location of Mendoza's city was in today's San Telmo district, south of the city center. 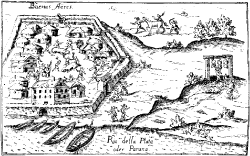 More attacks by the indigenous peoples forced the settlers away, and in 1541 the site was abandoned. A second settlement was established in 1580 by Juan de Garay, who arrived by sailing down the Paraná River from Asunción, now the capital of Paraguay. From its earliest days, the success of Buenos Aires depended on trade. During most of the seventeenth and eighteenth centuries, Spain insisted that all trade to Europe pass through Lima, Peru, so that taxes could be collected. This scheme frustrated the traders of Buenos Aires, and a thriving contraband industry developed. Unsurprisingly, this also instilled resentment among the porteños (residents of Buenos Aires) against Spanish authorities. Sensing these feelings, Carlos III of Spain progressively eased the trade restrictions and finally declared Buenos Aires an open port in the late 1700s. These placating actions did not have the desired effect, however; and the porteños, some of them versed in the ideology of the French Revolution, became even more desirous of independence from Spain. During the British invasions of the Río de la Plata, British forces attacked Buenos Aires twice in 1806–1807 but were repulsed by local militias. Ultimately, on May 25, 1810, while Spain endured the Peninsular War and after a week of mostly peaceful deliberations, the criollo (European) citizens of Buenos Aires successfully ousted the Spanish Viceroy and established a provisional government. May 25 is now celebrated as a national holiday, May Revolution Day. Formal independence from Spain was declared only in 1816. Historically, Buenos Aires has been Argentina's main center for liberal and free-trade ideas, while many of the provinces, especially to the northwest, advocated a more conservative-Catholic approach to political and social issues. Many tensions within Argentine history, starting with the centralist-federalist conflicts of the nineteenth century, can be traced back to these contrasting views. In the nineteenth century the city suffered naval blockades on two occasions: by the French from 1838 to 1840, and a joint Anglo-French blockade from 1845 to 1848. Both blockades failed to gain surrender of the city, and the foreign powers eventually gave up. During most of the nineteenth century, the political status of the city remained a sensitive subject. It was already capital of Buenos Aires Province, and between 1853 and 1860 it was the capital of the seceded State of Buenos Aires. The issue was debated more than once on the battlefield, until the matter was finally settled in 1880, when the city was federalized and became the seat of government, with its mayor appointed by the president. The Casa Rosada became the seat of the office of the President. Railroad construction in the second half of the nineteenth century increased the economic power of the city as raw materials flowed into its factories, and Buenos Aires became a multicultural city that ranked itself with the major European capitals. The Colón Theater emerged as one of the world's top opera venues. The city's main avenues were built in those years, and the dawn of the twentieth century saw the construction of South America's then-tallest buildings and first subway network. By the 1920s Buenos Aires was a favored destination for immigrants from Europe, as well as from the poorer provinces and neighboring countries. Large shanty towns, called (villas miseria), started growing around the city's industrial areas, leading to extensive social problems, which contrasted sharply with Argentina's image as a country of riches. Buenos Aires was also the cradle of Peronism, under the leadership of Juan Peron, (serving as president from 1946 to 1955 and from 1973 to 1974) and Eva Peron: the now-mythical demonstration of October 17, 1945 took place in Plaza de Mayo. 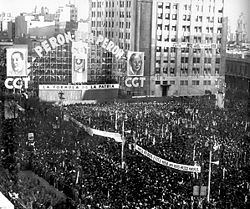 Industrial workers of the Greater Buenos Aires industrial belt have been Peronism's main support base ever since, and Plaza de Mayo became the site for demonstrations and many of the country's political events. On June 16, 1955 a splinter faction of the navy bombed the Plaza de Mayo area, killing 364 civilians. This was the only time the city was attacked from the air. This event was followed by a military uprising that would depose President Perón three months later. In the 1970s, the city suffered from fighting between the left-wing revolutionary movements (Montoneros, E.R.P., and F.A.R.) and the right-wing Argentine Anticommunist Alliance (Triple A), supported by Isabel Perón, who became President of Argentina in 1974, after Juan Perón's death. The military coup of 1976, led by Jorge Rafael Videla, only escalated this conflict; the subsequent "Dirty War" produced between 10,000 and 30,000 desaparecidos, ("the disappeared") people kidnapped and killed by the military during the years of the junta. The silent marches of their mothers (Mothers of the Plaza de Mayo) are a well-known image of Argentine suffering during those times. The city was visited by Pope John Paul II twice: in 1982, due to the outbreak of the Falklands-Malvinas War, and a second visit in 1987, which gathered crowds never seen before in the city. On March 17, 1992 a bomb exploded in the Israeli Embassy killing 29 and injuring 242. Another explosion, known as the AMIA bombing), destroyed a building housing several Jewish organizations on July 18, 1994, killing 85 and injuring many more. On December 30, 2004, a fire at República Cromagnon concert hall killed almost 200 people, the greatest non-natural tragedy in Argentine history. 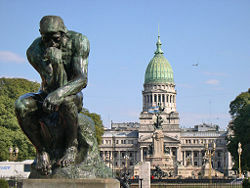 As the nation's capital, Buenos Aires is home to the three branches of Argentina's government: the executive (president and vice-president), legislative (bicameral National Congress or Congreso Nacional) and judicial (Supreme Court or Corte Suprema). In 1996, under the 1994 reform of the Argentine Constitution, the city gained autonomous status, and held its first mayoral elections. The mayor's title was changed to "Chief of Government." The winner was Fernando de la Rúa, who would be President of Argentina in the period from 1999 to 2001. De la Rúa's successor, Aníbal Ibarra, won two popular elections, but was impeached and ultimately deposed on March 6, 2006 as a result of the fire at República Cromagnon. Jorge Telerman, who had been the acting mayor, was invested with the office. In the mayoral election of June 3, 2007, Mauricio Macri obtained a plurality of the vote, forcing a runoff election against Daniel Filmus on June 24, which Macri won with over 60 percent of the vote. Buenos Aires is represented in the Argentine Senate by three senators. The people of Buenos Aires also elect 25 national deputies for the Argentine Chamber of Deputies. The city is divided into 48 barrios (neighborhoods) for administrative purposes. The division was originally based on Catholic parroquias (parishes), but has undergone a series of changes since the 1940s. A newer scheme has divided the city into 15 comunas (communes). The people of Buenos Aires are known as porteños (people of the port), due to the significance of the port in the development of the city and the nation. The people of Buenos Aires province (sometimes excluding the city's suburbia) are called bonaerenses (people of good air or 'bon aire'). According to the 2001 census, the city proper has a population of 2,776,138, while the Greater Buenos Aires metropolitan area has more than 12.4 million inhabitants. More recent estimates put the latter figure at more than 13 million The population of the city proper has been stagnant since the late 1960s, due to low birth rates and a slow emigration to suburbia. Most porteños have European origins, with Spanish and Italian descent being the most common, mainly from the Galician, Asturian, and Basque regions of Spain, and the Calabrian, Ligurian, Piedmont, Lombardy and Neapolitan regions of Italy. Other European origins include German, Portuguese, Polish, Irish, French, Croatian, English and Welsh. In the 1990s, there was a small wave of immigration from Romania and Ukraine. There is a minority of old criollo (European) stock, dating back to the Spanish colonial days. Criollo and Spanish-aboriginal (mestizo) population in the city has increased mostly as a result of migration, both from the provinces and from nearby countries such as Bolivia, Peru and Paraguay, since the second half of the twentieth century. Important Arab (mostly Syrian-Lebanese) and Armenian communities have been significant in commerce and civic life since the beginning of the twentieth century. The Jewish community in Greater Buenos Aires numbers around 250,000, and is the largest in Latin America. Most are of Northern and Eastern European Ashkenazi origin, mostly German and Russian Jews; with a significant minority of Sephardic, mostly Syrian Jews. Besides substantial immigration from neighboring countries, during the middle and late 1990s Argentina received significant numbers of people from Asian countries such as Korea (both North and South), China and Vietnam, which joined the previously existing Sino-Japanese communities in Buenos Aires. According to official data, between 1992 and 2003 an average 13,187 people per year immigrated legally in Argentina. The government calculates that a total of 504,000 people entered the country during the same period, giving about 345,000 illegal immigrants. The same source gives a plausible total figure of 750,000 illegals currently residing in Argentina. Most inhabitants are Roman Catholic. Buenos Aires is the seat of a Roman Catholic metropolitan archbishop (who is the prelate of Argentina), as well as of several Eastern Orthodox and Anglican hierarchies. Evangelical churches have steadily increased their ranks since the 1980s. Sizable Jewish and Muslim communities have existed in the city for over 100 years. The city has a humid subtropical climate with average temperatures in the afternoon ranging from 30°C (86°F) in January to 10°C (50°F) in July. Rain can be expected at any time of year. Snow fell on July 9, 2007 for the first time since 1918. Hailstorms are a more common phenomenon. Many locals leave Buenos Aires during the hot summer months (December, January and February) and head for seaside resorts on the Atlantic coast. A building with European and modern styles in Buenos Aires. Buenos Aires is the financial, industrial, commercial, and cultural hub of Argentina. Its port is one of the busiest in the world. Navigable rivers by way of the Rio de la Plata connect the port to north-east Argentina, Brazil, Uruguay and Paraguay. As a result, it serves as the distribution hub for a vast area of the south-eastern region of the South American continent. In 2007 the city has a mean Nominal GDP per capita of around $US 14,000, which makes it one of the wealthiest cities in Latin America. To the west of Buenos Aires is the Pampa Húmeda, the most productive agricultural region of Argentina (as opposed to the dry southern Pampa, mostly used for cattle farming). Meat, dairy, grain, tobacco, wool and hide products are processed or manufactured in the Buenos Aires area. Other leading industries are automobile manufacturing, oil refining, metalworking, machine building, and the production of textiles, chemicals, clothing, and beverages. Strongly influenced by European culture, Buenos Aires is sometimes referred to as the "Paris of South America." It is the site of the Teatro Colón, one of the world's greatest opera houses. There are several symphony orchestras and choral societies. The city has numerous museums related to history, fine arts, modern arts, decorative arts, popular arts, sacred art, arts and crafts, theater, and popular music, as well as the preserved homes of noted art collectors, writers, composers and artists. It harbors many public libraries and cultural associations as well as the largest concentration of active theaters in Latin America. It has a world-famous zoo and Botanical Garden, a large number of landscaped parks and squares, as well as churches and places of worship of many denominations, many of which are architecturally noteworthy. Tango music was born in the suburbs, notably in the brothels of the Junín y Lavalle district and in the arrabales (poorer suburbs). Its sensual dance moves were not seen as respectable until adopted by the Parisian high society in the 1920s, and then all over the world. In Buenos Aires, tango dancing schools (known as academias) were usually men-only establishments. Starting in the 1920s, the Buenos Aires style of tango music evolved into an elaborate genre. In its heyday, tango had many famous orchestras such as those led by Aníbal Troilo and Juan D'Arienzo, and singers such as Carlos Gardel and Edmundo Rivero. Tango enjoyed a resurgence in global popularity later in the twentieth century due almost exclusively to Astor Piazzolla and his development of the tango nuevo style. Buenos Aires holds an annual "Tango Day" each December 11. In the San Telmo barrio, Sundays are devoted to tango shows on the streets and antiques trade in the bazaars around Dorrego Square. 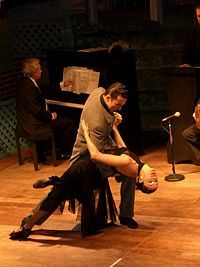 Tango shows can be found in establishments such as Rivero's El Viejo Almacén. Buenos Aires has been the center of the Argentine cinema industry in Argentina for over 100 years since French camera operator Eugene Py directed the pioneering film La Bandera Argentina in 1897. Since then, over 2000 films have been directed and produced within the city. The culture of tango music has been incorporated into many of the films produced. Buenos Aires publishes the largest newspapers in the country, many of which have electronic editions on the Internet. The largest daily circulation is claimed by Clarín. While lower in circulation, La Nación and La Prensa, founded in 1870 and 1869, respectively, are highly regarded in the Spanish-speaking world as well as among the international press. The English-language daily Buenos Aires Herald is also widely available throughout the republic. During the military dictatorship of the 1970s it was well-known for its independent stance and open criticism of the government. Foreign-language papers are common in the capital. The majority of radio and television stations are privately operated. They have periodically become organs of state propaganda, only to be returned to some independence by succeeding governments. Buenos Aires is also one of the most important book and magazine publishing centers in Latin America. ISPs provide dial-up, cable, satellite-based and ADSL connections. The Internet boom in the early 2000s gave birth to many cibercafés. There are a growing number of wi-fi hotspots, mostly around the downtown area and now in all "Subte" lines, except for the A line, which is in process. The main tourist attractions of Buenos Aires are around the downtown area, including Plaza de Mayo, Florida Street, and Puerto Madero. The Plaza de Mayo lies at the heart of Buenos Aires. The offices of the president of Argentina, the Casa Rosada (called so because of the building's pink overtones) are at the east end of the plaza. A broad boulevard called the Avenida de Mayo runs west from the Plaza de Mayo to the Plaza del Congreso and the National Congress Building. The Plaza de Mayo is also the site of the Metropolitan Cathedral, another significant building from the colonial period. The rest of what remains of colonial Buenos Aires is located mostly south of the plaza, in the recently restored San Telmo, or Barrio Sur district. 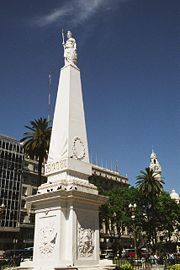 The central business district lies just north and west of the Plaza de Mayo. The Avenida 9 de Julio, the widest street in the world, runs north and south through this district. This street is 425 feet (130 meters) wide. East of the central business district lies the city's waterfront, with huge docks and other facilities for oceangoing ships. Residential neighborhoods called barrios occupy most of the other parts of Buenos Aires. Each barrio has its own churches, schools, grocery stores, meat markets, and bakeries. One of Buenos Aires' most colorful barrios is La Boca, which is known for its brightly painted houses and excellent Italian restaurants. A majority of residents in Buenos Aires and its suburbs use public transportation. A Buenos Aires invention is the "colectivo," originally a small bus built out of a truck chassis and seating 21 to 27. Today they have grown in size and carry up to 60 passengers. Numerous colectivos and larger public buses traverse the city continuously each hour providing access to virtually all neighborhoods. The Buenos Aires Metro (locally known as el subte, from "subterráneo" meaning "underground") is an extensive system providing access to various parts of the city. Opened in 1913, it is the oldest subway system in the Southern Hemisphere and in the Spanish-speaking world. Buenos Aires had an extensive tramway network with over 857 km (535 mi) of track, which was dismantled during the 1960s in favor of bus transportation. A new 2-km light rail tram "Tranvía del Este" in the Puerto Madero district is now operating. Extensions planned will link the Retiro and Constitución terminal train stations. Buenos Aires used to be relatively congestion-free for a city of its size. Toll highways were opened in the late 1970s by then-mayor Osvaldo Cacciatore providing fast access to the downtown area, and increasing the number of cars coming into the city. During Cacciatore's tenure, the streets of the downtown financial district (roughly one square kilometer in size) were declared off-limits to private cars during daytime. Main avenues of the city include the 140 meter (460 feet) wide 9 de Julio Avenue, the over-35-km-long (22 mi) Rivadavia Avenue, and Corrientes Avenue, the main thoroughfare of culture and entertainment. Avenida General Paz is a motorway that surrounds Buenos Aires thus separating the city from Buenos Aires Province. Argentina's extensive railway network converges in Buenos Aires. The three principal stations for both long-distance passenger services and commuter trains are Estación Retiro, Estación Constitución, and Estación Once. Most lines use Diesel power; some commuter lines switched to electric power during the 1980s and 1990s. A Buenos Aires-Rosario-Córdoba high-speed railway, which would join the three largest cities in Argentina, has also been proposed. Bids were opened in mid-2006, but the only proposal standing as of June 2007 is by French firm Alstom. Financing is a major stumbling block for the project, whose start has been delayed several times. The Buenos Aires international airport, Ministro Pistarini International Airport, is located in the suburb of Ezeiza and is often called simply "Ezeiza." The Aeroparque Jorge Newbery airport, located in the Palermo neighborhood next to the riverbank, serves mostly domestic traffic. Football (soccer) is a passion for Argentines. Buenos Aires has the highest concentration of football teams of any city in the world (featuring no less than 24 professional football teams), with many of its teams playing in the major league. The best-known rivalry is the one between Boca Juniors and River Plate. Other major clubs include San Lorenzo de Almagro, Vélez Sársfield and Huracán. Buenos Aires has been a candidate city for the Summer Olympic Games on three occasions: for the 1956 Games, lost by a single vote to Melbourne; for the 1968 Summer Olympics, which were held in Mexico City (to this date, the only Games held in Latin America); and in 2004, when the games were awarded to Athens. Buenos Aires hosted the 1951 Pan American Games - the first and was also host city to several World Championship events: the 1950 and 1990 Basketball World Championships, the 1982 and 2002 Men's Volleyball World Championships and—most remembered—the 1978 FIFA World Cup, won by Argentina on June 25, 1978 when it defeated the Netherlands by 3–1. Other popular sports in Buenos Aires are horse racing, tennis, golf, basketball, rugby, and field hockey. Famous sportsmen native to the Buenos Aires area include soccer star Diego Maradona and tennis great Guillermo Vilas. ↑ Buenos Aires Reinventing Itself Travel+Leisure. Retrieved March 22, 2012. ↑ Cultural Capital of Latin America Official Website of the City of Buenos Aires. Retrieved March 22, 2012. ↑ Argentina: Censo2010. Retrieved March 22, 2012. ↑ Desarrollo humano en Argentina / 2010. Retrieved February 24, 2012. ↑ Marcela Lópéz Levy, We are Millions: Neo-liberalism and new forms of political action in Argentina (London: Latin America Bureau, 2004). ↑ Cathy Runciman and Leticia Saharrea (eds. ), Time Out Guide: Buenos Aires (London: Penguin Books, 2001). ↑ 50 sporting things you must do before you die, The Observer, April 4, 2004. Retrieved May 31, 2016. All links retrieved May 31, 2016. (Spanish) Official government website. www.buenosaires.gov.ar. This page was last modified on 31 May 2016, at 16:11.